In U.S. presidential politics the "threat" of Mahmoud Ahmadinejad's Iran has emerged as a potent political issue comparable to Saddam Hussein's Iraq and "weapons of mass destruction" (WMD ) in the period leading up to the invasion of Iraq in March 2003. Republican presidential candidates have jumped all over the issue of what the U.S. should do about Iran's nuclear program. Sensing an opportunity to gain political advantage, some have sought to portray Iran as a serious threat to the security of the United States and the entire world. Mitt Romney at the November 12 Republican presidential debate stated "If we re-elect Barack Obama, Iran will have a nuclear weapon.if you elect me as the next president, they will not have a nuclear weapon." At the same debate Newt Gingrich supported " maximum covert operations to block and disrupt the Iranian program, including taking out their scientists, including breaking up their systems, all of it covertly, all of it deniable. If in the end, despite all of those things, the dictatorship persists you have to take whatever steps are necessary to break its capacity to have a nuclear weapon." At the November 22 CNN National Security Debate Michelle Bachmann claimed ".Iran has announced their plan to strike Israel. He [President Ahmadinejad] has said that if he has a nuclear weapon he will use it to wipe Israel off the face of the earth. He will use it against the United States of America." Jon Huntsman added "At some point, they're going to have enough in the way of fissile material out of which to make a weapon.the mullahs have already decided they want to go nuclear. Why? They have looked at North Korea. They've got a weapon. Nobody touches them." In contrast Iran's government claims that its nuclear program is designed for peaceful purposes and for the time when Iran's oil will have become exhausted in satisfying the world demand for petroleum. Appearing on the November 17th edition of MSNBC's Morning Joe, the Secretary General of the High Council for Human Rights of Iran, Mohammad Javad Larijani, said Iran was not concerned with producing nuclear weapons because they would be "more liability than asset for us" and that that nuclear weapons were "against Islamic code." He said Iran's "military muscle is strong enough to repel or deter any imminent threat." Larijani claimed that the U.S., not Iran, was the greatest source of state sponsored terrorist activity and asked why the U.S. and its allies were so critical of the Iranian nuclear program while seeming to ignore Israel's nuclear weapons. As I noted in The Iraq War: Origins and Consequences, politics and the perception of U.S. public opinion became major factors influencing the behavior of top political figures and were crucial factors leading to the invasion of Iraq. Under pressure from the Bush administration and under the influence of flawed "intelligence" reports that Iraq possessed WMD the US House of Representatives on October 10, 2002 voted 296 to 133 for the "Joint Resolution to Authorize the Use of United States Armed Forces Against Iraq." The resolution stated "Iraq both poses a continuing threat to the national security of the United States and international peace and security in the Persian Gulf region and remains in material and unacceptable breach of its international obligations by, among other things,... actively seeking a nuclear weapons capability, and supporting and harboring terrorist organizations. " The resolution was supported by 97 percent of Republican representatives. In the Senate 98 percent of Republican senators supported the bill but so did 57 percent of Democratic senators. Democrats in favor of the war bill included senators who later displayed presidential aspirations such as Hilary Clinton of New York, John Edwards of North Carolina, John Carey of Massachusetts, Christopher Dodd of Connecticut and Joe Biden of Delaware, the current U.S. vice-president. Since a majority of voters appeared to support a U.S. attack against Iraq in the fall of 2002, it is probable that Democrats planning to run for president concluded that it was politically expedient to authorize war. The same political incentive is likely influencing Republican candidates to exaggerate a threat from Iran in order to gain advantage over one another in caucuses and primaries and their potential opponent in the general election, President Obama. But as was the case with the politically motivated pro-war frenzy leading up to the Iraq War, the same criticisms apply to the current hyper anti-Iranianism of the U.S. presidential campaign. First, for Iran to use a nuclear weapon against Israel or the United States or any of their allies would be a suicidal act resulting in the death of millions of Iranians. This likely fate prevented Iraq from using the WMD it possessed in the 1991 Gulf War despite dire military circumstances. This elementary awareness, though somehow absent from the public discourse of many U.S. political figures, journalists, talk show hosts and even some supposed Middle East experts, certainly plays a role in the decisions of Iran's leaders. Second, the Iranian president appears to have expressed a hope that Israel would cease to exist as a political entity, not that it should be wiped out through the use of nuclear weapons. It is virtually impossible to conceive that any Islamic nation, including Iran, would want to use nuclear weapons offensively against Israel. One reason is that Jerusalem is a sacred place for Muslims. Another is that such a drastic action would be disastrous to the Palestinian cause, a cause that Iran, like other Islamic nations, supports. Any nuclear attack against Israel would result in the deaths of hundreds of thousands of Arab Palestinians whom reside in Israel or live nearby and the land Palestinians want for a nation of their own becoming an uninhabitable wasteland. Third, given the obviously self-destructive nature of an Iranian decision to attack the U.S. or its allies with a nuclear weapon, the question of the significance of Iran possessing an unusable nuclear weapon or appearing to possess the potential for developing one should be addressed. There appear to be two major reasons why Iran or other Islamic Middle Eastern nations could benefit from possessing nuclear weapons. The first is to deter an attack from the United States or Israel by having the capability to inflict politically unacceptable casualties on them. This is a lesson that Saddam Hussein claimed he learned too late (that Iraq should not have occupied Kuwait until after it had a nuclear weapon) and that, after the US-led invasion of Iraq, North Korea acted upon by proving through nuclear tests that it had succeeded in developing nuclear weapons. Iran and other Islamic nations might also perceive that possessing nuclear weapons could neutralize the intimidation effect of Israel's nuclear weapons. Israel, faced with one or more nuclear-armed adversaries, might prove more amenable to the establishment of a viable Arab Palestinian state. But in reality it may not be necessary for Iran to actually build a nuclear weapon to achieve these goals. It may be sufficient just for other nations to believe that it has the material capability and the knowledge to do so when and if it wants. James DeFronzo (Sociology, University of Connecticut) is the author of Revolutions and Revolutionary Movements (2011, Westview-Perseus) and The Iraq War: Origins and Consequences (2010, Westview-Perseus), and editor of the three volume encyclopedia Revolutionary Movements in World History (2006, ABC-CLIO). The Iraq War explains the compelling and interrelated sociological and political forces that led to war, accounting for important aspects of the occupation, varieties of resistance, and the conflict's influence on other nations. 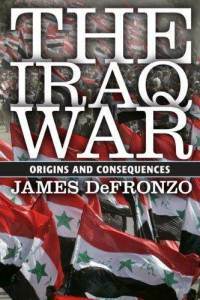 Beyond a systematic study of the invasion, occupation, and the future of the U.S.-Iraq relationship, DeFronzo also covers the early history of Iraq, the British mandate, the antimonarchy revolution, the role of the Iraqi Communist Party and the struggle between the Communists and the Baathists, and the influence of the Saddam Hussein regime and its wars-the Iran-Iraq War, the invasion of Kuwait, and the Persian Gulf War. The Iraq War is a probing analysis of the underlying factors that devastated Iraq, shook the U.S. political system, and helped shape political developments around the world and provides an historical, social and economic framework for understanding the role of Iran, other Islamic nations and Israel in U.S. politics.